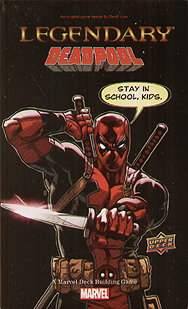 Hi there, I'm Deadpool, Assassin Extraordinaire, Famous Person, and overall handsome fellow. If you don't play Legendary, then you and I are going to have some words. So here's the deal - take this cute little box over to the counter, have the nice game store attendant put your money into the register, and take me home for a night of Legendary and chimichangas!